As a consultant and leader of a consulting firm, inquiry is your most powerful tool. Last week’s article drew from toddlers’ propensity to say No. Consultants can learn even more from little tykes. Consultants and consulting firms need to adopt that childlike dependence on inquiry. By asking the right questions you can engage prospects, position your consulting firm to win lucrative projects, and uncover superior solutions. That’s why the heart and soul of Becoming the Obvious Choice (a.k.a. Step 5 in this excellent book) is discovery. That’s also why the Context Discussion, which anchors the discovery process is essentially a series of questions. The following Whys can all be slotted neatly into your Context Discussions. They’re just a start, though. I’ve left an open space in the 9 Whys list for your additions. 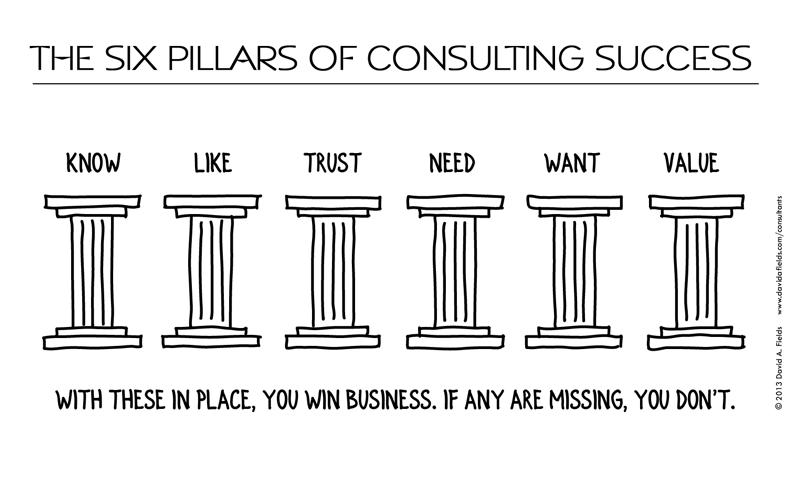 What other Why questions do you think are essential in consulting? Also I coach my clients that reporters ask “Why YOU? and Why NOW?” to discern the news value of a press release from the reader’s perspective. Interesting, Janet. “Why Not Share?” may be a useful, probe with prospects and clients who keep their information and ideas close to the vest. Good one! This is a good reminder to continue to ask questions as I head to a new client project next month.Thanks! My additional Why is “Why Them” when selecting groups for training or picking staff to become trainers. Opens the discussion on broader systemic issues that clients always overlook. Why Them? is a terrific addition to the list, and forces the client to think through criteria. Good luck on the new client project, and thanks for contributing to the list! There is the “Why do you NEED this?” question and then there is the “Why do you WANT this?” question. Quite often clients claim to “need” something as an essential, and it turns out (once you have done the appropriate discovery & clarification) that it is really more of a “want” / something non-essential. And they may have completely misdiagnosed their problems, and therefore have not uncovered what they truly do NEED. One of my favorite project manager’s mantra’s re: project/solution scope & implementation was: “You [the client] can’t always get what you want, but you’ll get what you need [from the project]”. Our job as consultants was to uncover the true needs & make sure that the solution addressed those needs..
Non-essential “wants” were relegated to a future project phase – and with time, quite often the client realized that they didn’t even want or need those “wants” anymore, once their true needs/problems had been addressed. Clients may not distinguish between Want and Need, but we consultants absolutely have to. As you’ve pointed out, understanding what clients Need is essential to delivering a high-value solution. Ironically, understanding what clients Want is how you actually compel a client to sign on the dotted line and start the project. What a customer wants is not always what they need. For example the latest trend in business is sustainability. Many companies, especially if you are a large company have a Sustainability Program, maybe a Sustainability Executive and really big companies have a sustainability dept. Yet what is sustainability? It actually a new name for the oldest problem in business. How to keep the doors open. How to keep eliminate or minimize disruption in your supply chain. Supply chains are connected to nearly all global events eventually. That same supply chain also has more demand and more potential customers. Due to advances in technology it is possible not only to monitor and analysis supply trends but to also manipulate this supply chain. Sustainability is also related to internal operations. These issues are as numerous and diverse as there are industries. But they revolve around the concept of maximizing internal operational efficiency. Are you utilizing all your assets? Aren’t there departments and/or individuals who are already responsible for both those decision and processes? So you want a Sustainability Program or Policy. Do you need a full-time Sustainability Executive or a part time sustainability check up? At Sustainable Practices Associates we the later is a better use of your resources. Put some sustainable practices to your internal cost. The interesting benefit to trends, fads, and business flavors of the month is that they focus attention and create movement. Even if the trend is exposing the same Need that others have talked about in different ways for years, decades or centuries, the new language can spark Want. As consultants, our probing Whys can lead a client to reframe his own Need into terms that fan the flames of Want too. Thanks for contributing your example, Joe.